..... Click the link for more information. ) and permeated with interconnecting air passages leading to the stomata. Leaves vary in size (up to 60 ft/18m long in some palms), shape, venation, color, and texture, and are classified as simple (one blade) or compound (divided into leaflets). The blade margins may be entire (smooth and unindented), toothed (with small sharp or wavy indentations), or lobed (with large indentations, or sinuses). In monocotyledonous plants, the veins are usually parallel; dicotyledons have leaves with reticulately branched veins that may be pinnate (with one central vein, the midrib, and smaller branching veins) or palmate (with several large veins branching from the leaf base into the blade). Pigments besides chlorophyll that give a leaf its characteristic color are the carotenoids (orange-red and yellow), the anthocyanins (red, purple, and blue), and the tannins (brown). White results from the absence of pigments. In deciduous plants, a layer of cells forms the abscission tissue at the base of the stalk in the autumn, cutting off the flow of sap; the unstable chlorophyll disintegrates and, in a temperate zone, the remaining pigments are displayed to produce colorful fall foliage. When these cells dry up completely, the leaf falls. Evergreen plants usually produce new leaves as soon as the old ones fall; the leaves of most conifers remain on the tree from 2 to 10 years (in some species up to 20 years). Leaves may be modified or specialized for protection (spines and bud scales), climbing (tendrils), trapping insects (as in pitcher plants), water storage (as in succulents), or food storage (bulb scales and, in the embryo plantlet, cotyledons). A lateral appendage which is borne on a plant stem at a node (joint) and which usually has a bud in its axil. In most plants, leaves are flattened in form, although they may be nearly cylindrical with a sheathing base as in onion. Leaves usually contain chlorophyll and are the principal organs in which the important processes of photosynthesis and transpiration occur. A complete dicotyledon leaf consists of three parts: the expanded portion or blade; the petiole which supports the blades; and the leaf base. Stipules are small appendages that arise as outgrowths of the leaf base and are attached at the base of the petiole. The leaves of monocotyledons may have a petiole and a blade, or they may be linear in shape without differentiation into these parts; in either case the leaf base usually encircles the stem. The leaves of grasses consist of a linear blade attached to the stem by an encircling sheath. Leaves are borne on a stem in a definite fixed order, or phyllotaxy, according to species (Fig. 1). For identification purposes, leaves are classified according to type (Fig. 2) and shape (Fig. 3), and types of margins (Fig. 4), tips, and bases (Fig. 5). The arrangement of the veins, or vascular bundles, of a leaf is called venation (Fig. 6). The main longitudinal veins are usually interconnected with small veins. Reticulate venation is most common in dicotyledons, parallel venation in monocotyledons. Surfaces of leaves provide many characteristics that are used in identification. A surface is glabrous if it is smooth or free from hairs; glaucous if covered with a whitish, waxy material, or “bloom”; scabrous if rough or harsh to the touch; pubescent, a general term for surfaces that are hairy; puberulent if covered with very fine, downlike hairs; villous if covered with long, soft, shaggy hairs; hirsute if the hairs are short, erect, and stiff; and hispid if they are dense, bristly, and harshly stiff. The texture may be described as succulent when the leaf is fleshy and juicy; hyaline if it is thin and almost wholly transparent; chartaceous if papery and opaque but thin; scarious if thin and dry, appearing shriveled; and coriaceous if tough, thickish, and leathery. The foliage leaf is the chief photosynthetic organ of most vascular plants. Although leaves vary greatly in size and form, they share the same basic organization of internal tissues and have similar developmental pathways. Like the stem and root, leaves consist of three basic tissue systems: the dermal tissue system, the vascular tissue system, and the ground tissue system. However, unlike stems and roots which usually have radial symmetry, the leaf blade usually shows dorsiventral symmetry, with vascular and other tissues being arranged in a flat plane. the organ of higher plants that performs the functions of photosynthesis and transpiration, ensures gas exchange with atmospheric air, and participates in other important processes of plant life activity. Morphology, anatomy, and origin. 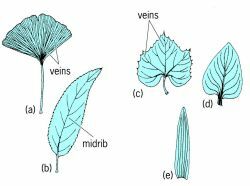 The leaf usually differs morphologically from the other vegetative organs of higher plants—the root and the stem—by its dorsoventral (and not radial) symmetry, lateral position, and, as a rule, limited basal growth. The leaf arises from the outer layers of cells of the primary meristem of the growing point of the stem. In the majority of plants the leaf initially grows apically and then inter-calarily. Most often the leaf consists of a broad, flat blade, or lamina, in which all basic physiological processes occur, and a leafstalk, or petiole, which attaches the blade to the stem. The petiole enables the leaf to occupy a definite position in relation to the light. In many plants, including a large number of Scro-phulariaceae and Labiatae, the leaf has no expressed petiole; such a leaf is called sessile. Often plants are encountered that simultaneously have both sessile and petiolate leaves. The lower part of the leaf is often broadened into a sheath, which more or less embraces the stem. Leaves with well-expressed sheaths are especially characteristic of Umbelliferae and Gramineae. In many plants paired, symmetrically placed appendages, or stipules, usually develop near the base of the leaf; the stipules are in the form of leaflets, bristles, or scales. The types of leaves are extremely varied. A leaf is simple when it has a petiole and a single blade; compound, when there is a central petiole, or central axis (rachis), and petioles (axes) of subsequent orders to which leaflets are attached. The parts that compose a typical compound leaf are equipped with nodes. The leaf blade may be rounded, elliptic, lanceolate, rhomboid, ovate, or one of many other shapes. A leaf may also be acicular, subulate, bristle-shaped, cylindrical, or some other form. In addition, leaves are described as being squamiform, peltate, or infundibuliform. 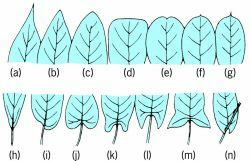 The shape of the base of the blade (for example, cordate, hastate, or reniform), the outline of its apex (pointed or obtuse), and the nature of its margin (dentate, serrate, crenate, or entire) are of great importance in the classification of leaves. Depending on the type and depth of segmentation of the blades, leaves are described as lobed, divided, or dissected. Of particular significance, especially in the research of fossil plants, is the type of venation in the blade (pinnate, digitate, palmate, or arcuate). The leaf may be glabrous, pubescent, rugose, scarious, coriaceous, or succulent. The average length of a leaf is 3–10 cm; however, its length may vary from a few mm to 20 m (in the resinous rafia palm). The life-span of a leaf, particularly of plants in temperate latitudes, is usually short—about six months; the leaves die at the end of the growing season. Only in evergreen plants are the leaves not changed periodically but live more than a year. The leaves of the same plant usually differ from one another insignificantly, mainly in size; however, sometimes heterophylly is observed. Leaves occur on the stem in a definite order and develop with a certain consistency. 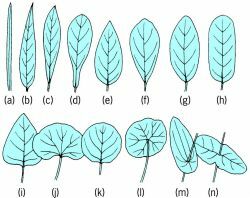 In many plants the leaf arrangement (phyllotaxy) and the active orientation of the leaves in the plane transverse to the direction of the light promote maximum utilization of light, forming a leaf mosaic. Leaves, particularly those of flowering plants, are sensitive to their environment and its changes. They are more capable than other organs of adaptive modifications; for example, they are able to adapt to life in arid regions and in other unusual or extreme conditions. 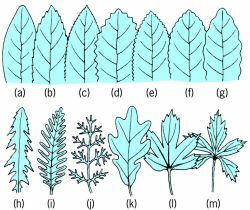 In spite of the structural similarity of their general features, there are significant differences in the characteristics of leaves in representatives of different divisions or classes of higher plants. The leaves of conifers are usually acicular, their epidermis has a thick cuticle, resin ducts pass through their central tissue, and their vascular bundles are surrounded by a special transfusion tissue. The leaves of dicotyledons as a rule have reticular veining, often with a dissected compound blade. The leaves of monocotyledons most often have parallel or arcuate venation, are often linear, and are only sometimes dissected. The anatomical structure of leaves differs even within a single species; however, the general features are uniform even in different species. Usually the blade is supplied on both sides with a single-layered tissue, the epidermis. 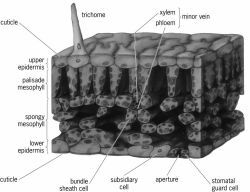 Between the upper and lower epidermis is the central tissue, or mesophyll, and the spongy tissue. The mesophyll is usually differentiated into columnar, or palisade, tissue, which consists of elongated cells with chloroplasts and occupies the upper part of the leaf that is turned toward the light. The spongy tissue is composed of cells with large intercellular spaces and fills the lower part of the leaf. The leaf is filled with veins—vascular bundles—that, along with the mechanical tissues, constitute the stroma of the leaf The mechanical tissues, which make the leaf firm, most often are located near large veins but sometimes develop into mesophyll. The cells of the epidermis are often colorless and group tightly together. They are living and, with the exception of the guard cells located in the epidermis, lack chlorophyll. The external surface of the epidermis is covered usually by a cuticle and sometimes with a waxy bloom, which provide the epidermis with its protective ability. It is possible that the hairs on the leaf surface also play a protective role. The numerous stomata in the epidermis permit the exchange of gases and transpiration. External air that penetrates the intercellular spaces of the spongy parenchyma enters the leaf, which in turn discharges gases and water vapor. The origin and development of the leaf is associated with the adaptation of plants to various conditions of terrestrial life. It is most probable that in the majority of plants the leaf is the result of the differentiation, flattening, and concrescence of the lateral axes of the branch system of the plant. Only in a few plants, such as the club mosses, does the leaf originate as an exogenous outgrowth of axial organs. Often the leaf is not considered to be a separate organ but only a part of the shoot, the principal organ of the plant. Bryophytes have leaflike outgrowths, which are often called leaves; however, they are not actually homologous with the leaves of other higher plants, since they form on the gametophyte (and not on the sporophyte as in other higher plants). Physiology. The leaf is an active organ that determines, directs, and regulates the life activity of the plant. By changing the quantity and quality of the products formed in the process of photosynthesis under the influence of various conditions, the leaves determine the growth of the plant and its productivity. The life activity of the leaf is closely connected with that of the entire plant. In supplying the plant with assimilates, the leaf, with the aid of other organs, supplies itself with water, mineral elements, and certain stimulating substances (such as kinins). Accordingly, the leaf has a number of features that are characteristically important for the performance of its functions. One feature is the leaf’s adaptability for intensive gaseous exchanges with atmospheric air. Thus, a surface area of 1 sq m can assimilate up to 6–8 g (3–4 liters) of CO2 and simultaneously release the same volume of O2 into the atmosphere. High effectiveness in the exchange of gases is ensured by the leaf’s structure (the thickness of the blade usually measures 0.1 –0.25 mm) and high indexes of the ratio of the blade’s surface S to the volume V(S/V = 100–200 cm2/cm3) or to the raw and dry weight (100 and 500 cm2/g, respectively). The high capacity of the leaf for gaseous exchange is determined by its great porositv, the presence of stomata in the epidermis (up to 30,000 per cm2), and the porous structure of the mesophyll. Intensive photosynthetic activity requires rapid outflow of the assimilates from the leaves into other organs. Thus, the rate of photosynthesis is determined by the degree of development of the vascular systems, particularly the phloem of the vascular bundles (veins). In some plants the anatomic structure and, specifically, the presence of parietal cells in the vascular bundles in which chloroplasts are concentrated and large quantities of starch are stored play a role in the intensification of the transport of food from the leaf to the other organs. Many plants whose leaves have such a structure (corn, sugarcane, sorghum) are characterized by a special type of photosynthesis, an intense rate of photosynthesis, and high productivity. An indispensable condition for photosynthesis is the presence in the chloroplasts of assimilating cells of chlorophyll and carotenoids, the contents of which differ in different plants. When there is a content of chlorophyll of 2–4 mg or more per square decimeter of leaf blade, the quantity of chlorophyll no longer limits photosynthesis. In this case the leaves absorb practically all the light energy entering them of wavelengths from 360 to 720 nanometers and some quantity of the energy of infrared rays (only about 5 percent of the energy passes through and 12–15 percent is usually reflected). Under these conditions, at noon on a sunny day 1 sq m of leaf blade can absorb up to 1.5 megajoules (360 kilocalories) of energy per hour. However, under the best conditions, only 5–10 percent of that energy is converted to the energy of chemical bonds. The rest is converted to heat and, in heating the leaf, is partially released into the atmosphere as a result of heat transfer. There is no overheating of the leaf, because approximately 247 kilojoules (59 kilocalories) are expended for every 100 g of water that the leaf transpires in large quantities (thus, 1 sq m of leaf surface, forming about 4–6 g of assimilates per hour under the highest illumination, can transpire up to 500–700 g of water). However, plants often (for example, in zones of deficient water supply) form leaves whose structure ensures a better supply of water and sometimes a greater rate of transpiration, increasing its suction force. When there are temporary disturbances of water balance, regulatory systems in the leaf are activated, such as movements of the stomata and the decrease in water transfer by the cells, which simultaneously lead to a decrease in the intensity of gaseous exchanges and, consequently, of photosynthesis. The waxy bloom on leaves, the pubescence of the epidermis, the decrease in the number of stomata, the thickening of the leaf as a result of intense development of well-hydrated tissue, and the conversion of leaves to thorns or scales (the photosynthetic function is performed in such cases by stem organs that contain chlorophyll) promote the maintenance of water-heat balance at an optimum level. There are also reduced leaves in many parasitic plants that feed on organic substances not obtained from photosynthesis but through suckers from their host plants. However, it is not the individual leaf or the solitary plant but their aggregate as integral photosynthesizing systems in natural or cultivated phytocoenoses that ensures in the process of photosynthesis the best use by leaves of the abundant sunlight that reaches the earth’s surface, of the CO2 from the air, and of the factors of soil fertility. Consequently, the highest productivity is obtained. Under favorable conditions, the phytocoenoses of the majority of plants can absorb practically all the energy of the light entering them and yield maximum productivity by forming an optimum leaf surface — 4 –5 sq m per sq m of earth surface. Thus, obtaining crops of the best quality and with optimum leaf surface is the most important task in increasing plant productivity. This problem is being solved in various ways based on the general principles of phytocoenoses and of the photosynthetic activity of leaves. Thus, through photosynthesis, which occurs predominantly in the leaf, the ecological function of green plants, which consists of absorbing solar energy for the biosynthesis of organic matter, is realized. Through the processes of photosynthesis and respiration, the leaves maintain the balance of O2 and CO2 in the air; through transpiration, leaves participate in the water cycle on earth. Use. Leaves are used by man in various ways. The leaves of many plants, such as lettuce, dock, dill, cabbage, onion, and parsley, are used as food. The leaves of henbane, senna, foxglove, and many other plants yield medicinal substances. Some leaves are used as feed for agricultural animals (hay, silage, and fresh grass). The leaves of the mulberry tree are food for the mulberry silkworm. Essential oils used in the perfume and confectionery industries are obtained from the leaves of geranium, mint, and other plants. The leaves of some plants yield tannins. Tea and tobacco leaves serve as raw materials in the tea and tobacco industries. In the tropics the leaves of many plants yield coarse fiber, and palm leaves are used as roofing material. Timiriazev, K. A. “Zhizn’ rasteniia (lektsiia 5).” Izbr. soch., vol. 1. Moscow, 1957. Serebriakov, I. G. Morfologiia vegetativnykh organov vysshikii rastenii. Moscow, 1952. Fotosinteziruiushchie sistemy vysokoi produktivnosti (collection). Moscow, 1966. Nichiporovich, A. A. Fotosintez i teoriia polucheniia vysokikh urozhaev. Moscow, 1956. Fedorov, A. A., M. E. Kirpichnikov, and Z. T. Artiushenko. Atlas po opisatel’noi morfologii vysshikh rastenii: List. Moscow-Leningrad, 1956. Botanika, 7th ed., vol. 1. Moscow, 1966. Esau, K. Anatomiia rastenii. Moscow, 1969. Fotosintez i ispol’zovanie solnechnoi energii (collection). Leningrad, 1971. What does it mean when you dream about a leaf? A modified aerial appendage which develops from a plant stem at a node, usually contains chlorophyll, and is the principal organ in which photosynthesis and transpiration occur. A separately movable division of a folding or sliding door. One of a pair of doors or windows. One of the two halves of a cavity wall. 1. A hinged part; a separately movable division of a folding or sliding door. 2. One of a pair of doors or windows. 3. One of the two halves of a cavity wall. (Or "terminal node") In a tree, a node which has no daughter. In database management, the last node of a tree. featuring a jacquard leaf design, could be an antique, except for its bold tobacco color. Cover the leaf with a small piece of paper to keep ink off your fingers and press all around, feeling the leaf through the paper. Curly leaf spinach should be washed, dried, packed loosely in a plastic bag, and then stored in the refrigerator crisper at a temperature of 40xF or below. Regardless, which areas will have their leaf collected New Year's week? For high resolution recordings, a linear displacement transducer was connected to a leaf margin by means of a mobile clamp separated by 15 mm from a second immobile clamp so that growth of the intervening leaf tissue could be recorded. Three products came from nurseries: summer oil (1/8 teaspoon oil diluted in 1 cup water), and two spray-on leaf polishes. Tahitian Noni International's delicate new harvesting and drying process enhances the full-bodied flavor of the noni leaf in this unique beverage. In the lawn maintenance wars played out in neighborhoods, one side brandishes traditional rakes of metal, plastic or wood, while the other wields the high-powered whine of continuous leaf blowers. The leaf pores, also called stomata, open to allow in carbon dioxide, which plants need for photosynthesis. This last experiment also suggests increased leaf auxin inhibits leaf growth if I assume that the NPA on the petiole, by inhibiting the movement of IAA out of the developing leaf results in an elevation of the level of the endogenous hormone in the treated leaf. Full shade also leaves it vulnerable to leaf spot diseases, especially in humid locations.